Crops are great this year, all over - no late frost! Blueberries are one of the easiest fruit to prepare and serve. There's no peeling, pitting, coring or cutting. They have few natural pests, (other than birds), so pesticides are generally unnecessary! This year's crop is fantastic (see related news story), thanks both to the weather and to more farms planting more blueberry bushes due to increased consumer demand over the past few years as more studies proclaim the anti-oxidant and other health properties of blueberries. Click here to find a local Blueberry Festival (usualy held between April and July). If you are looking for information about a similar berry, the saskatoon (also called the June berry or Serviceberry) see this page about saskatoons. Select plump, full blueberries with a light gray-blue color. A berry with any hint of red isn't fully ripened. White and green colored blueberries will not ripen after they are picked; while blueberries that have already turned purple, red or blue-ish usually DO ripen after they are picked (if they are kept at room temperature to ripen). Since blueberries hang on the bushes in bunches a but like grapes do, the easiest and fastest way to pick them is hold your bucket under them in one hand and with your other hand, cup a ripe bunch and gently rub them with your fingers. The ripe berries will drop into your bucket, while the unripe ones will remain attached to the bush. When the bushes are at peak, I can easily pick 2 gallons per hour (if I'm not being distracted by the kids and the sun isn't too hot!). A newbie might do 1 gallon per hour.and at the beginnng or end of th season it takes more time as the berries are not as plentiful nor concertrated in clusters. Don't wash berries until just before using, to prevent berries from becoming mushy. Chill berries soon after picking to increase shelf life. Store your fresh blueberries in the refrigerator as soon as you get them home, without washing them, in a covered bowl or storage container. If refrigerated, fresh-picked blueberries will keep 10 to 14 days. Keep in mind that blueberries vary considerably in density and moisture content, so these ranges are approximates. 1 pound of fresh blueberries is usually between about 2 and 3 cups of berries. 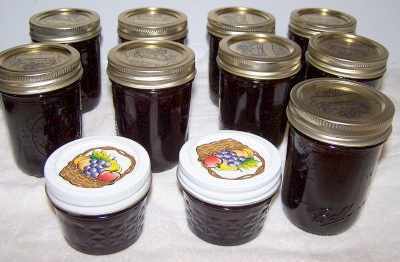 A normal batch of blueberry preserves, jam or jelly requires 5 pints of berries. Blueberries do come in a variety of sizes from small (190-250 berries per cup) to extra large (<90 berries per cup). Where are blueberries grown (commercially)? As much as you may wish to drive out on summer Saturday to pick blueberries, not all areas can grow them commercially. 38 states grow blueberries commercially, but 10 of these states dominateand produce more than 98% of U.S. commercial production: California, Florida, Georgia, Indiana, Michigan, Mississippi, New Jersey, North Carolina, Oregon and Washington. British Columbia in Canada also produces highbush blueberries. Saskatoons.s - common to western Canada and the northwest of the U.S.lartger, a bit less sweet; almost identical to a Huckleberry. Whorlberry or whortleberry grown in the United Kingdom. Much like a bilberry. Weights and measures: 1 cup of blueberries normally weighs about 143 grams, which about 1/3 of a pound, so 1 pound of blueberries is almost 3 cup's worth. Of course, this can vary considerably based on the variety, weather conditions and degree of ripeness. 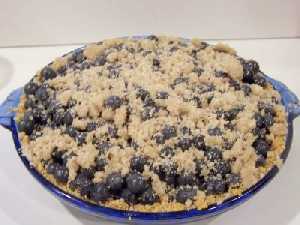 Typically, many recipes call for 3 to 4 cups of blueberries for a 9 inch pie. Nutrition and miscellaneous facts: 1 cup (143 grams) of blueberries is 84 calories (technically, kcal). Blueberries contain no cholesterol or fat and are also low in calories. Blueberries are high in dietary fiber, Vitamin A and niacin. They contain iron and other trace minerals and are a fair source of Vitamin C. Blueberries have a diverse range of micronutrients, with notably high levels (relative to respective Dietary Reference Intakes) of the essential dietary mineral manganese, vitamin B6, vitamin C, vitamin K and dietary fiber (table below). One serving provides a relatively low glycemic load score of 4 out of 100 per day. One serving size of fresh blueberries is equal to one cup, or 140 grams. This contains 80 calories, with no fat, cholesterol or sodium. One serving also contains 5 grams of dietary fiber, 19 grams of total carbohydrates, and 1 gram of protein. The world's best Blueberry pie, recipe and directions and illustrated! Coat them with flour before adding to the batter. Just gently shake the blueberries in a bag (plastic or paper) with 1/2 cup of flour, then dump them mix in a sieve to remove excess flour. It may just be that your batter is too thin. try making the batter a little thicker! Fill the muffin cups or baking pan up to 1/4 full with batter (which hasn't had blueberries added to it yet); then stir the blueberries into the remaining batter, and continue to fill the muffin cups or bread pan. The blueberries will start off higher in the mix! The US Highbush Blueberry Council hasn't updated their blueberry festivals page in 2 years, so I researched, added to, updated it, and put the current information on a new page - click here for the blueberry festivals page. Q. How do I remove blueberry stains on clothes? Rinse fresh stains immediately in cold water. Soak any more difficult stains in a solution of 1 Tbsp. vinegar in 1 quart (or 1 liter) of warm water. Tide Laundry Detergent recommends soaking the stained article for up to 30 minutes in 1 gallon of water with 1/2 scoop dry Tide with Bleach or 1/2 measuring ladle of liquid Tide with bleach. in a plastic bucket. Keep the clothing submerged by placing a white towel on top of it. Discard the soaking solution prior to laundering. Q. 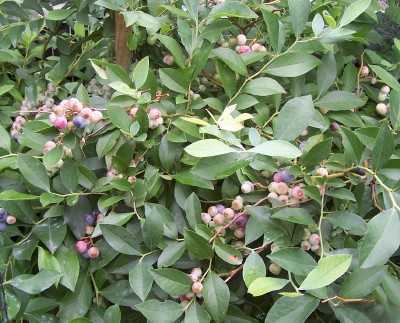 We would like to purchase some blueberry plants and plant them this November. Where can we purchase some nice size plants ? Being shallow rooted, blueberry bushes are constantly sending shoots off the side roots. These well started planted shoots can be dug with a generous portion of root and replanted. Just be sure: get plenty of root, mulch and fertilize annually and water sufficiently, especially the first year. Replant in late fall or early winter. Cut off about 1/3 of the shoot so the root system matches the top. Find a friend with a blueberry patch and help yourself! I've been very disappointed with the blueberry bushes I ordered from mail order nurseries; the plants were tiny (6 inches or so). The ones at my local Wal-Mart usually looked pretty pathetic. In my experience, Lowes and Home Depot usually have big (2 ft tall) healthy plants that are suited to your local climate. Beware mislabeled plants - I've purchased plants from big box stores which were not the variety on the label, although that was peaches and apples, not blueberries. The local nurseries often have nice stock, but my local nursery's prices were pretty high, unless I wait for an end of season sale.. I've been happy with the one's at Lowe's and Home Depot! Q. My Mom always told me to put my freshly picked blueberries into a bowl of water. She said the ones that float have bugs in them or are bad. How can I tell if this is true? A. That's just an old wives' tale. Some float because they are less dense, which may be due to a variety of causes, only rarely because a bug is inside. The only pest I've heard of getting inside a blueberry is the blueberry maggot, larvae of Spotted Wing Drosophila, which affects some plants in the north eastern US and parts of Canada. Place 1 litre (2 pints) of berries in pot. Nearly cover the berries with water. Bring berries and water to a frothy boil and boil for at least 1 minute. Empty berries into a 4-mesh-per-inch screen. Gently crush berries in screen with the back of a spoon. Rinse berries with cold running water and collect water and solids in a pan with a black bottom. Allow the debris to settle and Decant floating solids and most of the water. Repeat washing and Decanting until water is clear. White maggots will be visible against the black bottom of the pan. Sugar concentration = 2 lbs (1 kg) brown sugar per 1.2 gallons (5 litres) of water. Place 1 litre (2 pints) of berries in a 4-litre (1 gallon) container. Gently crush berries in container. Add sugar concentrate to 3 cm above crushed berries. Agitate crushed berries in sugar solution. Allow maggots to float to surface.